Hello! Welcome to the first day of Taylored Expressions June Sneak Peeks! The Baker's Dozen is kicking off 4 days of projects (3 days of peeks and release day). This release is HUGE!!! We are releasing 13 new stamp sets, 12 dies, 9 Little Bits dies and 3 cutting plates! All products will be released on Thursday, June 5, @ 7 AM PST. Today we are previewing several new stamps and dies, including our new Little Bits die collection. This new product line of smaller dies is both more affordable and also perfectly sized to be used as embellishments and focal images depending on what sized card you use them on. They also work well with the new Pockets & Pages 3x4 Circle Showcase die, which is perfect for pocket and traditional scrapbooking and cards. I have two cards to show you today. The first one features a few new products: Little Bits of Summer stamp set, P&P 3x4 Circle Showcase and Little Bits - Flowers & Stems dies. It's time to say Hello... to summer! My next card also uses the P&P Circle Showcase die. 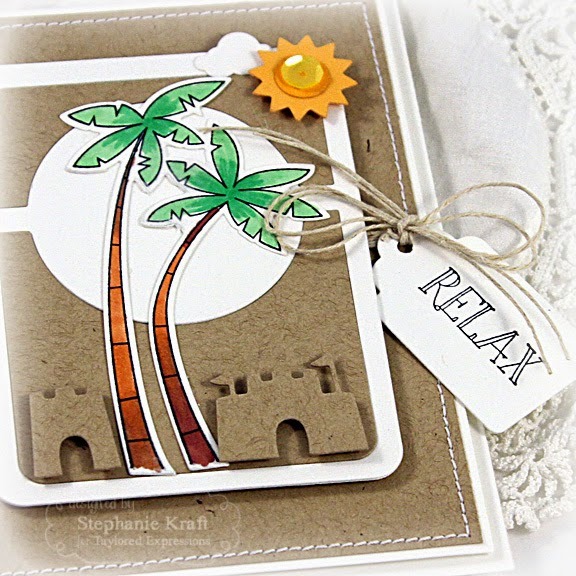 The palm trees and sentiment are from Big Kahuna (there is both a new stamp set and coordinating dies, which I used to cut the palm trees). For accents I used Little Bits - Sandcastle and Little Bits - Sun & Clouds. Accessories: Taylored Dies: P&P 3x4 Circle Showcase, P&P 3x4 Essentials, Journal Tabs, Little Bits – Flowers & Stems (TE); 1 ½ “ circle punch (EK Success), Ribbon, Silver Sprinkles (Doodlebug), Foam tape, Thread, Sewing machine. Accessories: Taylored Dies: Big Kahuna, Little Bits – Sandcastle, Little Bits – Sun & Clouds, P&P 3x4 Circle Showcase, Tag Stacklets 1 (TE); Markers (Copic), Hemp cord, Sequin, Foam tape, Thread, Sewing machine. 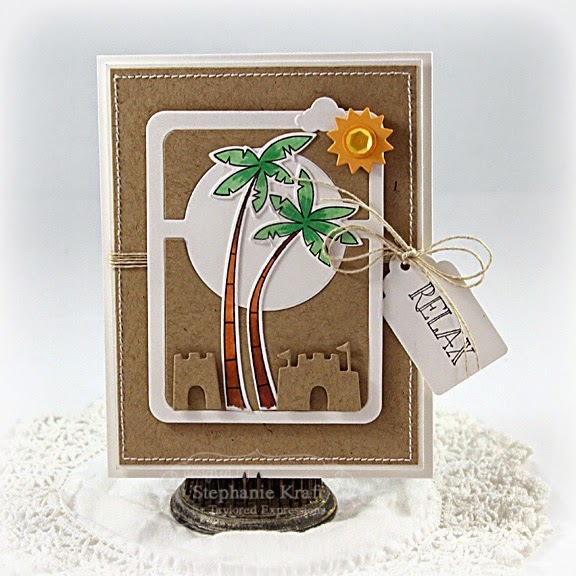 Beautiful cards, Stephanie...I just love how you used the P&P die on both...such super fun summer designs!!!!!!! Love your sandcastle card. Simple but with so much detail. Love it!